For the most part, monkeys used for testing purposes are bred for that specific aim. While there are breeding facilities locally, some of the animals are imported, depending on the required monkey. In addition, some non-human primates used are caught in the wild. The uses for non-human primates are broad but they primarily entail toxicology testing, which is focused on assessing the toxicity and safety of drugs, chemicals and other substances. Non-human primates are also used for studies investigating the biology of the human body and treatment of diseases such as AIDS. Another use for non-human primates is psychological testing in areas such as learning. They have also been successfully used in the study of genetics and reproductive disorders. Notable contributions to knowledge that are based on non-human primate testing include the development of the polio vaccine. In addition, their use has contributed greatly to our knowledge of vision, human brain biology and deep brain stimulation. Non-human primates are also considered highly useful for their participation in more than one experiment. When used in milder experiments that don't sustain lingering effects, non-human primates can be used for further experimental testing. One of the notable challenges in using non-human primates is that they can be quite difficult to handle. Therefore, restraints are commonly required, but the downside to restraints is that they may cause the animal to experience stress and fear, which can then sway the results. Inaccurate data can mean increased costs to run the experiments again or compromised approval of the drug. It also means that animals were essentially used in an experiment that was void, rendering their lives useless in terms of any suffering or death being in vain. Currently, alternatives to physical restraints include the addition of psychological support, using chemical restraints to subdue the animal or actually training the animals to accept the restraint. 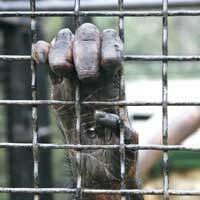 Abuses of non-human primates tend to create a high level of media attention. This, in part, relates to the focus of many animal welfare campaigns that target researchers who perform work on these animals. One highly publicised case of abuse involved research conducted at the University of Wisconsin. A 'pit of despair' was created that was meant to induce clinical depression. Baby monkeys were placed in a tiny chamber that contained food and water holders as well as a waste chamber to remove waste. Monkeys were placed in these chambers, where they remained isolated for six weeks. After the isolation, monkeys were hostile, withdrawn and unsociable; most did not recover. Non-human primates are very similar to humans in comparison with other animal models. It is for this reason that a great deal of the controversy surrounding animal testing is centred on non-human primates. In fact, some of the most threatening attacks on researchers have occurred as a response to a researcher's use of non-human primates. Attacks have occurred on researchers working at several universities in the United States. In one case that occurred at Columbia University several years ago, a researcher who was using baboons received numerous threats, which ultimately led him to halt his research because he feared for his safety. He did, however, still cite that he believed his work to be humane and ethical. While the overall use of non-human primates remains low, there have been small spikes in use in recent years for the United States, Britain and in particular, China. China's poor regulations and increase in outsourcing from countries with strict regulations have contributed to the increased numbers of non-human primates being used for animal testing. Britain, however, strictly regulates animal testing and most notably, the use of non-human primates. Levels of suffering are assessed and the experimental aims are carefully considered in the process of granting a project license. Ideally, the use of animal testing alternatives will continue to progress such that the number of non-human primates and all other animals can be reduced. Anybody who has ANYTHING to do with this disgusting, violent treatment of animals should be prosecuted to the fullest measure.Almost ALL of the testing on animals for the welfare of humans is irrelevant!What kind of human being could possibly be OK with this - it's absolutely heartless!Some day they will have to answer to what they've done.